NUBIA, KNOWN AS THE Gateway to the SUDAN, does not exist as a political entity in the 21st century. Geographically, the section of Northeast Africa that was once Nubia has been encompassed into northern Sudan and southern EGYPT, with cataracts (areas where geological forces have formed outcroppings of rock) along the NILE RIVER determining Nubia’s so-called boundaries. The land once known as Nubia is located between the First Cataract south of Aswan and the Sixth Cataract near KHARTOUM. Contemporary Nubia ranges from the Nubian Desert, which makes up the easternmost section of the Sahara Desert, to the more fertile Nile Valley area. Since 1970, as a result of the High Dam Project initiated by Egyptian president Gamal Abdul Nasser, most of Nubia has been covered by Lake Nasser, the world’s largest lake. Some 120,000 Nubians were relocated to cities such as Kom Ombo, Sukkot, Mahas, and Halfawi in Egypt and New Halfa and Khashm al- Girba in the Sudan. Some Nubians refused to leave the area, preferring to move to higher grounds away from the dam. In new communities, approximately 85 percent of all Nubian males were forced to find work outside the areas. Some Nubians continue to be employed in traditional service jobs. However, as Nubians have become more educated, large numbers have become doctors, lawyers, teachers, and other professionals. Recently, after years of exile, a number of Nubians returned to the banks of the Nile River through the efforts of the High Dam Lake Development Authority with government grants to establish new agricultural communities. Nubian history is portioned into three major periods: ancient, Christian, and Islamic. Ancient Nubian culture dates from 34th century B.C.E. to the 4th century C.E. Nubia began as a pastoralist area until urban centers emerged around the 26th century B.C.E. These cultures are referred to as A-Group and C-Group respectively. A major trading center, Kerma, flourished in Upper Nubia around 2500 to 1550 B.C.E. Kerma’s unique burial mounds and delicate objects suggest a highly advanced civilization, and it is known from Egyptian records that Kermans traded extensively with Egypt and other states in the eastern Mediterranean. When Egypt lost power in the region during a period of fragmentation about 1700 B.C.E., the Kerman kings also gained control of parts of Lower Nubia, absorbing C-Group cultures. The Egyptians retook most of Nubia, including Kerma, after the latter’s resurgence between 1550 and 1450 B.C.E. 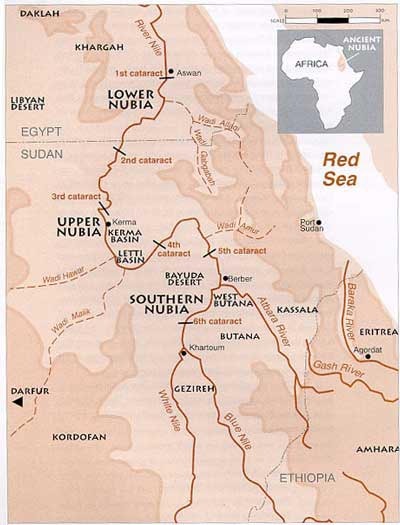 Lower and Upper Nubia were separated into the Egyptian provinces of Wawat and Kush. During that time, most of the region’s polities absorbed Egyptian culture and customs, though they retained a separate identity. Kush eventually overtook Egypt to form the 25th “Cushite” Dynasty that ruled Egypt and Nubia between 750 and 663 B.C.E. Subsequent Nubian capitals at Napata and Meröe consecutively lasted until the 3rd century C.E., when Meröe was destroyed by the Ethiopians. The X-Group or Ballana culture marks Nubia’s transition to the Christian era. Ballana replaced Meröe as the predominant culture in the region, and was absorbed into the Kingdom of Noabdia, which became fully Christianized under Byzantium influence during the 5th and 6th centuries. Two successive states, Makuria (which absorbed Nobadia) and Alodia emerged in the 7th century. Nubia became an isolated region, cut off from the Byzantine world during Muslim expansion; despite this, the region managed to retain its Christian identity until the 15th century, when it dissolved through conquest and intermarriage. As the Ottomans occupied Nubia proper, the Funj Empire was created in southern Nubia. Both areas were conquered by the Egyptians, then the British, during the 19th century. Nubia became a joint Egyptian and British protectorate in 1899, and was renamed the Anglo-Egyptian Sudan. Geographically, Nubian land is made up of arid desert filled with sand and black rocks. The desert climate results in hot, dry summers and moderate winters. The Egyptian section of Nubia rarely sees rain, and the Sudanese section sees only small amounts. Khartoum, for instance, rarely sees more than 7 in (18 cm) annually. In addition to persistent draught, Nubians must also contend with dust storms, earthquakes, flash floods, and landslides that can damage crops and threaten lives and property. The rock throughout Nubia is either sandstone or granite. In sandstone areas, the Nile Valley is made up of wide alluvial floodplains. This area near Aswan is the most fertile section of Nubia. Nubian land is bordered on the east and west of the Nile by cultivated fields. The western section is dotted with a number of small watering holes. In Upper and Southern Nubia, sections of granite formation have resulted in narrow, sharp cliffs that are generally infertile. This section has been divided into the Batn el Hajar, the Abri-Delgo Reach, the Dongola Reach, the Abu Hamed Reach, and the Shendi Reach, making up five distinct topographic regions along the Nile River. Nubia was considered a major location along the African trade route and provided essential natural resources such as gold, ivory, copper, ebony, and dolerite. Since ancient times, the palm tree has also provided a major component of the Nubian economy. Palm trees are frequently given as gifts. They are also used to manufacture a number of products such as furniture and rugs and are used as fuel and animal food. The fruit of the date palm continues to be the most economically viable byproduct of Nubian palms. Other agricultural products of modern Nubia include sorghum and millet. Transplanted Nubians maintain many of their traditions and cultural characteristics. In addition to Arabic, Nubians have continued to speak dialects such as Sukot, Halfawi, Mahas, and Dongolawi. Understanding the importance of customs and rituals to a displaced people, Nubians form their own closely knit communities in areas of migration. Ancient Nubian rituals are often centered on the all-important Nile River. Newborn infants were immersed in its waters for protection. Newlyweds bathed in the Nile to promote fertility. As part of the mourning ceremony, Nubian women washed mud and blue dye from their bodies. Henna and perfumes were submitted as offerings to the great Nile River. The belief in water angels survived the introduction of both Christianity and Islam into Nubia. The New Nubia Museum, which opened in November 1997, was erected near the Cataract Hotel in Aswan to bring together over 2,000 Nubian treasures and relics, including jewelry, pottery, and scarabs. The centerpiece of the museum is a gigantic statue of Rameses II. Overall, 23 Nubian temples and shrines were relocated, including the temple of Queen Hatshepsut, which was dismantled and transported in crates to Egypt’s National Museum. The temple of Kalabsha, the memorial chapel of Rameses II, and the Kiosk of Kertassi have been reconstructed near the High Dam. While most of the archaeological finds remain in the area, Nubia has become familiar to people in other areas through the relocation of significant relics to museums around the world in response to donations to UNESCO’s (United Nations) massive preservation project of the 1960s. Such relics include the Temple of Dendur, which has been relocated to the Metropolitan Museum in New York City, and the Greco-Roman temple of Debod, now located in Madrid.